Are you a dessert girl? Dessert girls aren't afraid to heat it up, shake it up, be a flirt, put it out there and flaunt it. They're full of sweetness and desire and they don't mind getting their hair a little messed up in the name of seduction. Dessert girls are warm and golden, luscious and radiant, tempting and decadent. They like to look good, feel good and smell good too. It's totally yummy and playful! Sparkle and shine with Dessert Treats deliciously kissable sugar shimmer for a smoochable all over glow. Spritz and shine with Jessica Simpson Dessert Treats Deliciously Kissable Hair and Body Shimmer Mist! For delicious hair, shoulders, arms or anywhere you dare to bare! Sweeten your kisses with Dessert Treats deliciously kissable lip candy, sheer and radiant, your lips will tingle and plump up for a perfectly sweet pout. Add power to your pout by plumping it up to maximum capacity with deliciously kissable flavors that will make you irresistibly kissable, even you won't be able to stop licking your lips! 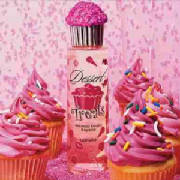 Be as sweet as cupcake with Dessert Treats deliciousy kissable fragrance. Flirtatious and fun, the perfect melody of sweetness and frosting. Tempting for anyone who wants to move in a little closer. WEAR IT, THEN SHARE IT! "Irresistibly creamy and yummy...like a smoothie for your skin. Filled with nutrients your skin will love. Rich and creamy, super-whipped and full of things your skin loves. These delicious body smoother tastes as good as they smell. Smell divine. Mouth-watering and fun in the shower, Dessert Treats deliciously kissable hair and body wash will condition and revitalize your hair while leaving your sking silky smooth. For a perfect shimmer and shine.